The mission of gimmeshelter is to address the physical need for shelter and the social need for community for persons who have been displaced by natural and man-made disasters. Six months later, gimmeshelter has partnered with Une Nouvelle Haiti (A New Haiti) in their continuing efforts to provide appropriate shelter and community for the Haitians who have been displaced by the natural disasters that have devastated their country over the past year. The mission of Une Nouvelle Haiti is very similar to gimmeshelter’s and as they work together they hope to accomplish significant change in Haiti. The synergy of their missions has greatly increased the scope of the project, expanding the original plan for a residential community into a micropolis including not only a residential community, but also educational, vocational, medical, commercial, and cultural components. Our strategy to rebuild Haiti is not just architectural, but social – educating and training the people in hopes to liberate them from the entitlement mentality which has been the status quo for Haitians for many years. Une Nouvelle Haiti already holds deed to nine acres of a thirty acre site in Titanyen, Haiti and one 60’X140’ Sprung Instant Structure. A team of ten will travel to Haiti November 11-15 to visit the center of the devastation in Port-au-Prince and the land in Titanyen. Four of them (including my Dad) will present a symposium for a select group of Haitian pastors to cast their vision for A New Haiti, and they hope to begin real work on the ground in the very near future. An electrical engineer, will also be traveling with us to access the requirements for bringing electrical power to the site. I’ve been slack about including pictures in my posts recently but I always think it helps to have a visual. Unfortunately, my Dad is always the one taking the pictures so he really doesn’t exist in photos…this two are from a year ago. 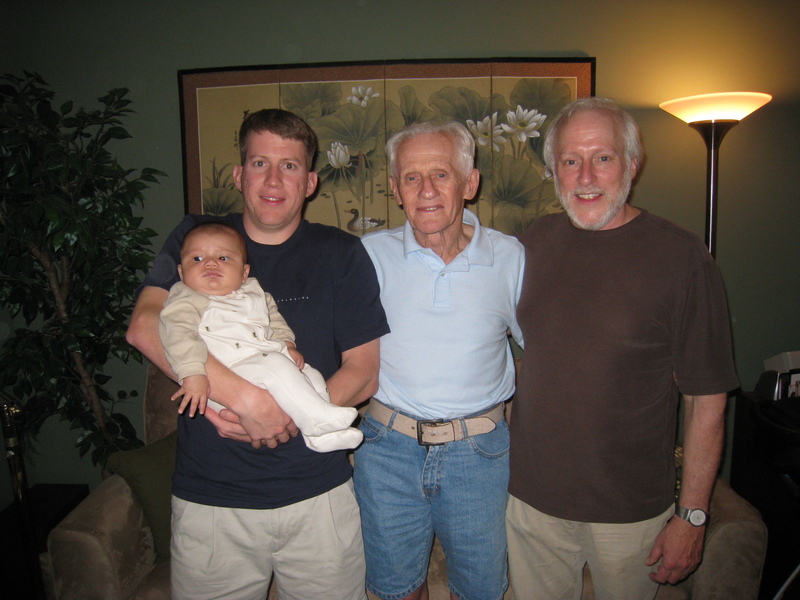 This one was at the beach and the one below is a picture we took of the 4 generations of Stancik men, my brother Paul, his son Chase, my grandpa Ed and my dad Glen. During the past few years I have experienced some really sweet times of living life together with our close community but I have also been frustrated as I learn to live life in a different way. 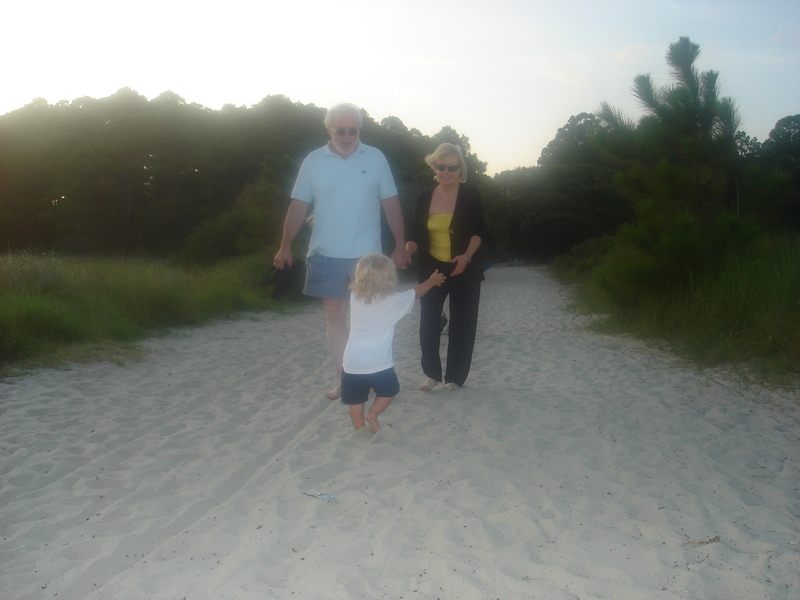 For me, the ultimate sacrifice that comes with parenthood is that of time. My time is not my own, and even though I’m ok with that, it’s not an easy transition. I have learned to cherish a few minutes of quiet whenever I can and I’m getting used to conversations with friends that consist of sentence fragments, incomplete thoughts, facial expressions and hand movements. We miss out on the details most of the time but we still get the big picture and enjoy the comradery that comes with the unspoken understanding that this is just life as we know it now. A month or two ago I began going on early morning runs with my sweet friend Lindsay and it has changed my life. The exercise is nice and it’s great to get a jumpstart on the day but the time for uninterrupted conversation has fed my soul like showers on parched ground. Add to that a semi-consistent Wednesday lunch date with another close friend (boy mom too), our Church’s annual women’s retreat at Montreat two weeks ago, a trip to Columbia for my dear college room mate’s baby shower last weekend, another visit from her and her doll husband yesterday, and even some late nights out with couple friends (thanks to our sweet and patient and probably very tired sitter) and I am a new woman. I may have said it here before, but if not, I feel like maintaining excellent mental health is one of the best things I can do for my family. I am a strong believer in the fact that “if mama ain’t happy, ain’t nobody happy”, so, I take very seriously my role in setting the tone in our home. I’m not suggesting that relationships and conversations are the source of life, but they can certainly be life-giving, and I know that if I were to completely neglect my time with Jesus and focus only on horizontal relationships I would dry up, no matter how many deep conversations and meaningful relationships I had. I do believe, however, that Jesus meets me in those places, and allows me to experience Him in the flesh through the people He has placed in my life. I’m grateful to the core that I have been granted these opportunities as of late, and even if it’s just for a season, it feels good to be full. 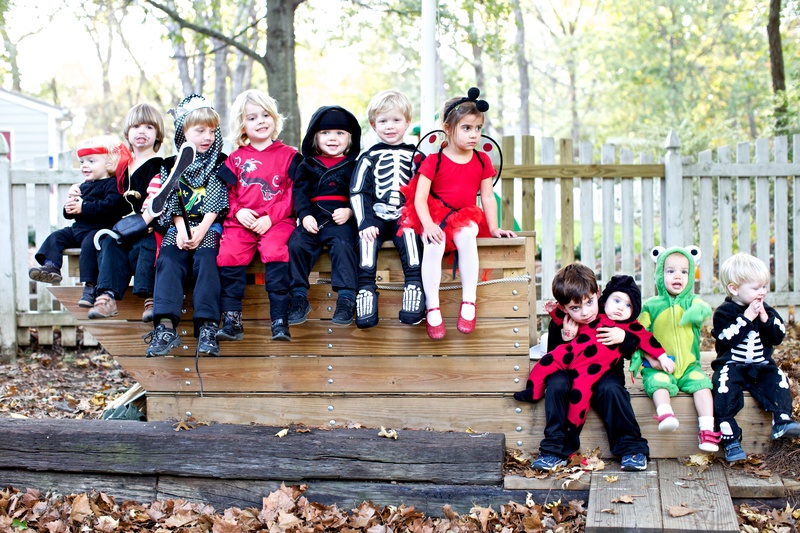 Porter didn’t get the memo that all costumes should be black, white and red. 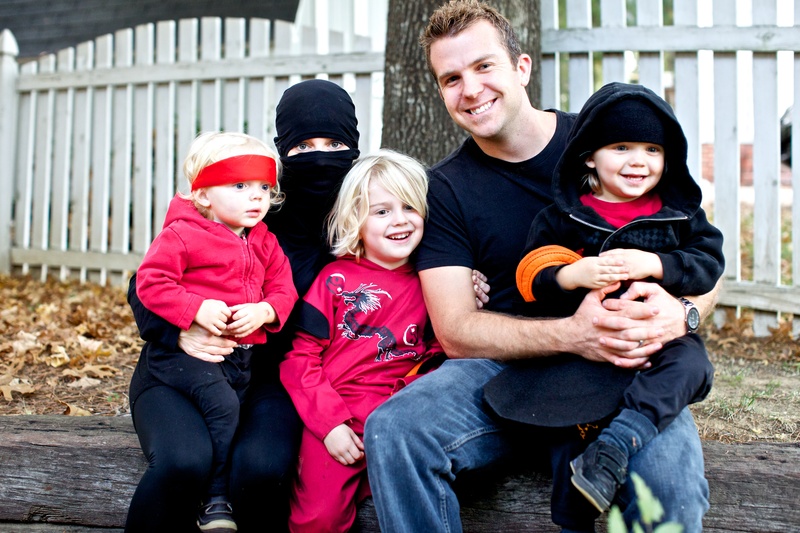 And although I appear to be dressed in a burka, I’m actually supposed to be a ninja…you just can’t see my sword! I’ve heard from several people that the previous link I posted to my card site was not working properly. Let’s try again. Click here or on the image below to take you to the blog. I’ve also had some people ask if I am able to do matte, folded or square cards this year. The answer is yes but unfortunately they will cost much more than the flat glossy cards. In order to keep my costs down and to provide the best price for all of my clients I have decided not to make them a standard option. Let me know if you have questions about that. So, I walk into my living room after having been gone for the weekend. My jaw drops and I immediately feel sick to my stomach. The coffee tables and end tables are all crooked, the couch has been moved away from the wall, the pillows and blankets are strewn across the room and there is crunched up food all over the floor…chips, cereal and peanut shells. Upon closer inspection, I realize that our couches and chairs are not leather but instead some cheap synthetic material. Each seat shows wear and several spots are cracked and threadbare. The big chair that is unofficially mine and Bennett’s has stuffing coming out of it. Then I notice three roaches on the floor next to the hearth. I look to the left and then the right as I count four more for a total of seven. Not knowing what to do first, I decide to turn off the lights. It doesn’t look so bad in the dark and I can’t see the roaches as well. Fortunately, this is not my literal reality. It’s just a dream. One I had last night. I am not a die-hard believer in Freudian Dream Theory but I don’t fully deny its legitimacy on some fronts. According to Freud, dreams are spyholes into our unconscious. Fears, desires and emotions that we are usually unaware of make themselves known through dreams. To Freud dreams were fundamentally about wish-fulfillment. Even “negative” dreams (punishment dreams and other anxiety dreams) are a form of wish-fulfilment; the wish being that certain events do not occur. Very often such dreams are interpreted as a warning. We used to give my mom a hard time about thinking too much of dreams. Sorry Mommy. I am starting to believe more and more that dreams are a way that God gets my attention and communicates to me things that I am too busy to hear or am unwilling to face. Almost every time I have a dream that I remember I can decipher some meaning, warning or deeper issue that is weighing on my heart. It was perfectly clear to me what this dream was about. I have been away for the past two weekends and while the time spent away was deeply fruitful and restful it created this severe time deficit in my home and family life. I have a rock star husband who manages our boys and the house with the greatest of ease while I am gone. I know I play an important role in our family but truthfully things go much more smoothly when I am away. But….lots of things go undone. I almost always come home to an immaculate house with freshly mopped floors but there is a dishwasher to be unloaded, piles of laundry to be done, a full inbox of emails to be thoughtfully answered, voice mails to be listened to and calls to return, mail to be sorted, lunches to be packed, clothes to be picked out, and design work that has been put on hold for way too long. On top of that there are calendars to be synced, stories to be read, “projects” to be cleaned up, conversations to be had, an “intimate relationship” to nurture and babies to rock and cuddle. Nevermind the cob-webs, dirt and fingerprints taking over. I can’t do it all and especially when I have been gone, I can’t expect to catch up in one day or even two weeks. I don’t think there’s an answer or easy resolution to this problem. It is what it is and I’m learning that some things will go undone. The first thing that goes for me is listening to voicemail and returning phone calls. Then I let the cleaning go (not the tidying) followed by sorting the mail. So, back to the dream. The reason my living room was disheveled in the dream, is because that and my perfectly made bed are the two areas I always feel totally in control of. No matter what is going on in my life or my home, I make my bed and I keep the living room vacuumed and in order. In the midst of a chaotic day, looking at the smoothly spread covers on my bed or the sterile magazine neatness of my living room gives me a pseudo sense of peace and order. I know that they don’t really offer any real control but I think it’s ok to have a thing or two that offer sanctuary in the physical realm. Today I am grateful for my two hours of alone time at Panera. It’s feels good to catch my breath. Maybe tonight I will have better dreams.